INSTRUCTOR DEVELOPMENT COURSE Become a PADI Instructor. 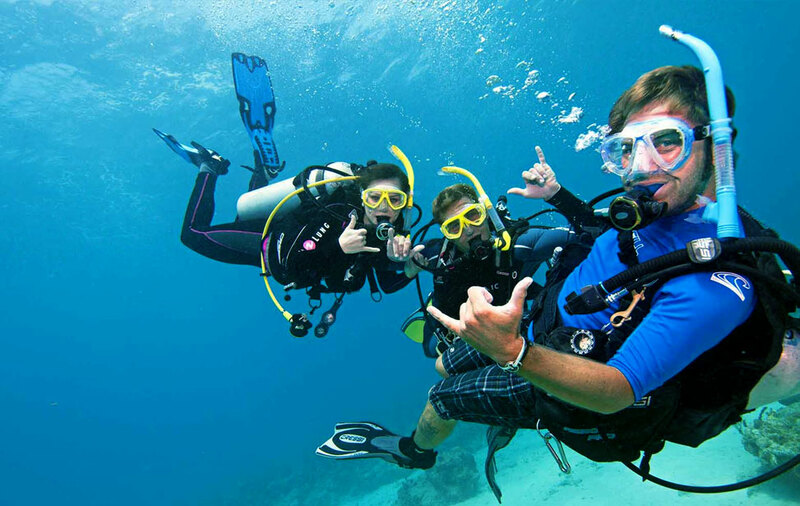 Holding the certification of PADI Instructor means you have excelled at the sport of diving. Not only are you an excellent diver, but you have a complete understanding of dive theory, equipment, safety, and the environment. You also possess the ability to safely teach others to enjoy the sport that has changed our lives! Be certified as a PADI Divemaster (or equivalent) or Instructor with another agency. Have been a certified diver for at least 6 months and have logged 60 dives to complete the AI course. Have been certified for at least one year and have logged 100 dives to complete the PADI Instructor Exam. Have completed Emergency First Response (or equivalent) within the past 2 years. Have a medical evaluation by a physician that is less than 1 year old. The PADI IDC is a 2 part process that includes both the AI and the OWSI (Open Water Scuba Instructor). During this course, you will learn all about the PADI system, programs, standards and procedures as well as the business side of diving, risk management and marketing. Considerable time is devoted to teaching you how to teach SCUBA in the class, confined and open water. Preparation is the key to getting the most out of your training. The PADI Instructor Exam is the final step in the IDC. A PADI Examiner will come to Destin to conduct this 2 day evaluation. You will be asked to teach a skill in the classroom, one in the confined water and 2 in the open water. You will also perform a rescue of an unconscious diver at the surface, pass a 5-part theory exam and 50 question standards and procedures exam. Anna will attend the Instructor Exam with you, lending support in any way she can! Class is held in the large comfortable room at Emerald Coast Scuba. It is equipped with modern AV equipment, a full SCUBA library, coffee & snack center and a large sunny deck overlooking the pool. The pool is located just outside the classroom. It’s a 14 foot deep, heated saltwater pool. 2 bathrooms with showers located on deck, next to the waterfall. Gear storage is available for you during your week with us. The water is on average between 86 and 92 degrees. The dives are made either at the Jetties or in the freshwater springs, depending on the time of year. The springs are a constant 68 degrees, so a 5-7 mil wetsuit should be suitable for this. You are encouraged to bring equipment that you are comfortable with and have had serviced recently. Please get in the water (pool or open) and practice a skill circuit – just like you did in your Divemaster course. While you’re at it, practice a rescue of an unconscious diver both with and without a pocket mask. You should be able to perform all of the skills listed in the skill circuit with demonstration quality. That means slow, relaxed and deliberate, with no problems. Please practice this circuit before your IDC. We will do a circuit on the second day of class and you will be expected to be able to score 3’s, 4’s and 5’s on each of the skills. (1 is lowest, 5 is highest). You should also be comfortable performing a rescue of an unconscious diver with a pocket mask. You will swim 800 yards with your mask, snorkel and fins – although not timed like it was in your Divemaster course. You should be completely familiar with the PADI Diving Knowledge Workbook. If you know the material in this book, you will do very well on the written theory exams (physics, physiology, skills & environment, equipment and RDP’s – table and e-RDPml). If you do not know this material – you should not expect to pass the exams. Another good practice for theory is to re-take the Divemaster exams. It is highly recommended that you take the new optional Dive Theory online. This $100 option is both a tutorial as well as a practice exam. This will ensure your dive theory knowledge is up to par AND fulfill the dive theory exam requirement during your IDC. Please do not expect to be taught this material at the IDC – there is not enough time AND this is pre-requisite material. We will take theory exams on the second day of your IDC. Numerous hotels are available near Emerald Coast Scuba. They range from the least expensive – Motel 6 850-837-0007 (call and ask for the weekly rate, not the nightly rate) or the Wingate Inn 850-654-4678. To rent a condo, try ResortQuest.com or VRBO.com. We begin the full IDC on Saturday with the OWSI starting on Monday. Both finish on the following Friday – with the IE on Sat-Sun. We usually finish the IE around noon on Sunday. Our typical days run from 8am until lunch (one hour) then class and water work until around 8pm. There is little free time during the IDC. The closest airport to Destin is VPS (Ft. Walton Beach) and is about 25 minutes from Destin. One hour away is a slightly larger airport PNS (Pensacola). Anna Schmitz (CD-19504) will conduct the course. Anna began teaching SCUBA full time in 1984 and IDC’s in 1989. Anna owns & operates Emerald Coasts Scuba. She has trained thousands of divers and instructors from around the world. Anna has achieved the status of “Gold” PADI Course Director in 2005, 2006 and 2007. She has since achieved “Platinum” status as a long-time PADI Course Director. Another highlight in her career was at the 2010 DEMA show in Las Vegas; where Emerald Coasts Scuba was awarded “Most Outstanding Dive Business” out of more than 1700 PADI Dive Centers in Canada, North America, Central and South America! Her dream of having her own facilities with an on-site pool came to fruition in 2005 with the opening of the new Emerald Coast Scuba building & pool in downtown Destin. Begin your on-line IDC lesson by clicking the PADI link at the bottom of this page. Upon completion, you will be directed to print out your results. Please bring this to your first day of class. Most candidates complete the on-line sections in a few sittings, so allow approx. one week to comfortably complete the sections. This optional segment will grant credit for this prior training. Be completely familiar with the Diving Knowledge Workbook. This is the theory you mastered in your Divemaster training – therefore, you are expected to be ready for exams in these 5 areas: Physics, Physiology, Equipment, Skills & Environment and the RPD (table and e-RDPml). The workbook is about $20 and should be considered your diving academic bible. If you know the material in the workbook, you will pass the IE exams. If you do not know the material, learn it before your IDC – this is important! It is highly recommended that you take the optional Dive Theory online. This $100 option is both a tutorial as well as a practice exam. This will ensure your dive theory knowledge is up to par AND fulfill the dive theory exam requirement during your IDC. Re-take the OLD PADI Divemaster exams. The exam booklet is around $10 and is another small investment to insure you are prepared for your exams. There are 2 exams in each topic. Know how to use the e-RDPml. They sell for around $30 and you will be expected to know how to teach a diver how to use one. Know how to tie the following knots: bowline, sheetbend and 2 half-hitches. Look in the Advanced manual – Adventures in Diving, search & recovery section. Be proficient in your skills. You are expected to have “demonstration quality” skill. There is a skill circuit located in the Divemaster section of your Instructor manual. Know how to perform a rescue of an unconscious diver at the surface – both using a pocket mask and without. We will practice this several times in the IDC. Practice in the same gear you plan to use during the course. Your gear should be in great working order and be a complete set, including signaling devices. Digital media is allowed but you must have original disks! You may not use the free digital Instructor manual given to Instructors who renew. As a new Instructor, you must have your own personal copy of the manual. Your Instructor Manual and/or PADI’s Guide to Teaching will have a hologram sticker included. This sticker is required to attend the PADI IE. To get started get your materials and start refreshing your dive theory knowledge. Feel free to contact Anna anytime with ANY questions you may have.